Jasmine Plantin (Flatbush) was born and raised in New York and has been surrounded by art and design since she was a child. She attended Parsons the New School for Design and Central Saint Martins for her undergraduate degree, where she was nominated for “Designer of the Year” and graduated with a BFA in Apparel Design in 2013. While pursuing her degree she apprenticed with design studios Proenza Schouler, Altuzarra and Phillip Lim until she graduated and began designing menswear for Greenpoint based company Outlier. Her work in textiles and fashion has appeared in international publications, such as Teen Vogue and Oyster Magazine, and has been displayed in Saks Fifth Avenue and at exhibitions in Paris, France. 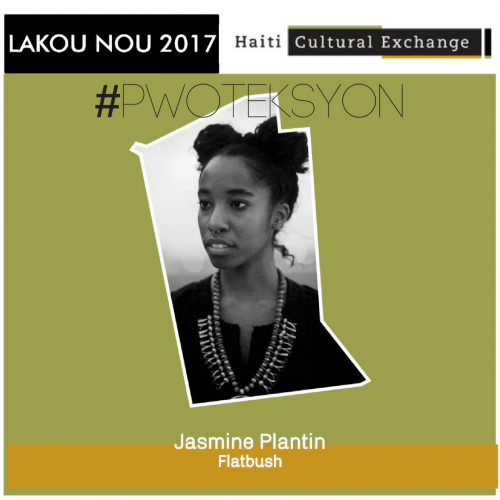 In #PWOTEKSYON, Jasmine will be exploring culture as mode of protection for the Haitian Diaspora in Flatbush through a two part evening, beginning with a panel discussion between Caribbean creatives highlighting how their heritage influences their work and introducing students to different artistic fields. The evening will end with an exhibition of narrative wearable art that she has developed in partnership with Haitian artisans highlighting the different periods of Haitian history. This entry was posted on Thursday, October 26th, 2017 at 5:54 pm	and is filed under Archive, HCX Programs, Lakou NOU. You can follow any responses to this entry through the RSS 2.0 feed. You can leave a response, or trackback from your own site.